Details: The Chemical Guys Happy Ending Microfiber Towel is a premium microfiber towel tailored for fine interior and exterior detailing. The Happy Ending Microfiber Towel is made with premium 70/30 blend microfiber for ultra-soft scratch-free cleaning. The towel is extremely fluffy for expanded surface area that traps harmful dust and dirt particles. Use the Happy Ending Microfiber Towel to buff off water or quick detail sprays for scratch-free drying. Use the Happy Ending Microfiber Towel on interior surfaces to wipe and clean light dust and dirt without the use of any chemicals. Chemical Guys Happy Ending Microfiber Towels are color coded for different areas across your car. 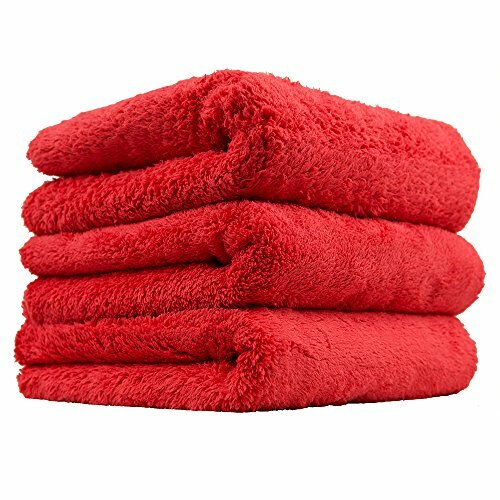 Red Happy Ending Microfiber Towels easily show dirt you missed during your wash, giving you a chance to flip the towel to a clean side before you install any scratches in exterior paintwork. Blue Happy Ending Microfiber Towels are perfect for sensitive interior automotive surfaces, such as wood inlays, chrome trim pieces, dashboard gauge clusters, and navigation screens. Low grade microfiber towels are made with hard polyester edges that can scratch sensitive automotive surfaces like paint. Chemical Guys Happy Ending Microfiber Towels are specially cut with industrial lasers to eliminate the risk of hard edges rubbing on paint. This seamless technology delivers seamless detailing perfection, and drastically reduces the risk of scratching sensitive automotive surfaces.